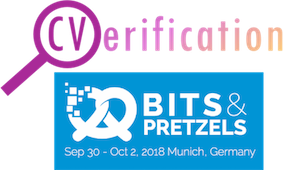 CVerification ( https://cverification.com ) takes part in the prestigious Bits & Pretzels conference, 30th Sept — 2nd Oct 2018, Munich, Germany. Startup pitch presentations and hands-on product demonstrations will concisely inform attendees on core product technologies and company values. Founder and CEO Milko Filipov, Cofounder and CTO James Lawton as well as Cofounder and CIO Evgeni Pirianov look forward to meeting investors and potential users on the well-established Bits & Pretzels this year. Participants will gain vivid insights into the highly innovative CVerification technologies for quick recruitment and reliable background verification of CVs, records, transcripts, and various other documents . The annual Bits & Pretzels ( https://www.bitsandpretzels.com ) for founders and start-up entrepreneurs coincides with the Oktoberfest in Bavaria’s capital. German and international founders meet investors from all over the world. In the past as well as upcoming Bits & Pretzels, many renowned individuals from different ecosystems may be met, such as British business magnate Richard Branson or American Actor Kevin Spacey. Meeting all CVerification founders in person as well as witnessing their presentation on the big startup pitch will provide compact, critical information. Moreover, at the company’s booth, the platform’s first version will be demonstrated as an impacting tool for rapid CV verification and submission, tailored to the demanding schedule of HR decision makers and job-seeking professionals. Based on extremely secure blockchain technology, CVerification practically eliminates costly background checks especially painful to small and many mid-sized companies.